intrinsic to our physical, incarnated dimension. we must first access them and the wisdom of their nature. enables us to do this, thus increasing our abilities to transform and heal. Each of the 20 cards consists of an exterior circle with a representation of each of the 4 “worlds”: a plant, an animal, a crystal, and a human. The humans depicted vary by age, gender, genetic pool, and condition. 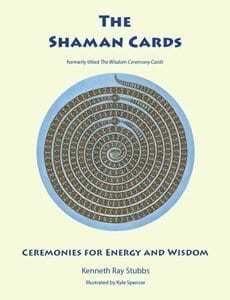 In the center of each card is an abstract concept, which also serves as the name of the card. The background painting is there for natural beauty.